Coin & Currency Supplies. Comic & Magazine Supplies. Photo & Postcard Supplies. CASE BREAK AUCTIONS – LIVE! Single Cards – Baseball. Single Cards – Football. Single Cards – Basketball. Single Cards – Hockey. Storage Boxes – Cardboard. 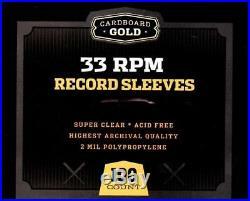 1 Case of 1000 CBG Brand Plastic Outer 33 RPM LP Vinyl Record Album Sleeves. The CBG 33 1/3 Record Album Sleeves are an acid free, archival quality product made of crystal clear polypropylene. Use with BCW Record Album Topload Holder – TLCH- 33RPM. Protect Collectible 33 1/3 Record Albums – Will hold both Single and Double Albums – 2 mil material thickness. Dimensions – 12 3/4 X 13. 100 Sleeve(s) per Pac. Columbia Hobby has been a family owned and trusted business since 1998. We strive to run a honest and ethical company that will not cut corners or cheat to make a sale. Our company supports families dealing with autism and you can feel good knowing that you are helping to support such a need. Thank you for making us the unquestioned online leader in collectible supplies and memorability display cases for the past 18+ years and we look forward to serving you for many more years to come. If you are ever in the Portland, OR / Vancouver WA area… Come by our retail store located in Vancouver. We’d love to see you! This does not apply if you are purchasing our custom glass display cases (see below). We do not mark merchandise values below value or mark items as “gifts”? US and International government regulations prohibit such behavior. Applies to glass cases only – This product ships factory direct to you. These items are made to order and worth the wait! We have been trusted in the hobby business since 1998. We are happy to help you get top dollar for your trading cards. If you won some cards in your case break that you aren’t interested in keeping or you found a treasure in the attic that you would like to sell… We have done it all. Item must be in BRAND NEW and UNUSED condition. Exact scans of the card are posted on the listing. We are not card graders nor do we claim to be but we will do our best to provide you with the most accurate info possible. All listings and auctions are created with the most accurate information available. The product inside will always be as described. If you have any questions at all regarding the product. Please submit them to us and we’d be happy to answer. Add to Favorite Sellers. Sign up to Newsletter. View more great items. This listing is currently undergoing maintenance, we apologise for any inconvenience caused. The item “1 Case of 1000 CBG Brand Plastic Outer 33 RPM LP Vinyl Record Album Sleeves” is in sale since Monday, November 17, 2014. This item is in the category “Music\Records”. The seller is “columbiasportscard” and is located in Vancouver, Washington. This item can be shipped to United States, Canada, United Kingdom, Denmark, Romania, Slovakia, Bulgaria, Czech republic, Finland, Hungary, Latvia, Lithuania, Malta, Estonia, Australia, Greece, Portugal, Cyprus, Slovenia, Japan, China, Sweden, South Korea, Indonesia, Taiwan, South africa, Thailand, Belgium, France, Hong Kong, Ireland, Netherlands, Poland, Spain, Italy, Germany, Austria, Russian federation, Israel, Mexico, New Zealand, Philippines, Singapore, Switzerland, Norway, Saudi arabia, Ukraine, United arab emirates, Qatar, Kuwait, Bahrain, Croatia, Malaysia, Brazil, Chile, Colombia, Costa rica, Dominican republic, Panama, Trinidad and tobago, Guatemala, El salvador, Honduras, Jamaica, Antigua and barbuda, Aruba, Belize, Dominica, Grenada, Saint kitts and nevis, Saint lucia, Montserrat, Turks and caicos islands, Barbados, Bangladesh, Bermuda, Brunei darussalam, Bolivia, Ecuador, Egypt, French guiana, Guernsey, Gibraltar, Guadeloupe, Iceland, Jersey, Jordan, Cambodia, Cayman islands, Liechtenstein, Sri lanka, Luxembourg, Monaco, Macao, Martinique, Maldives, Nicaragua, Oman, Peru, Pakistan, Paraguay, Reunion.